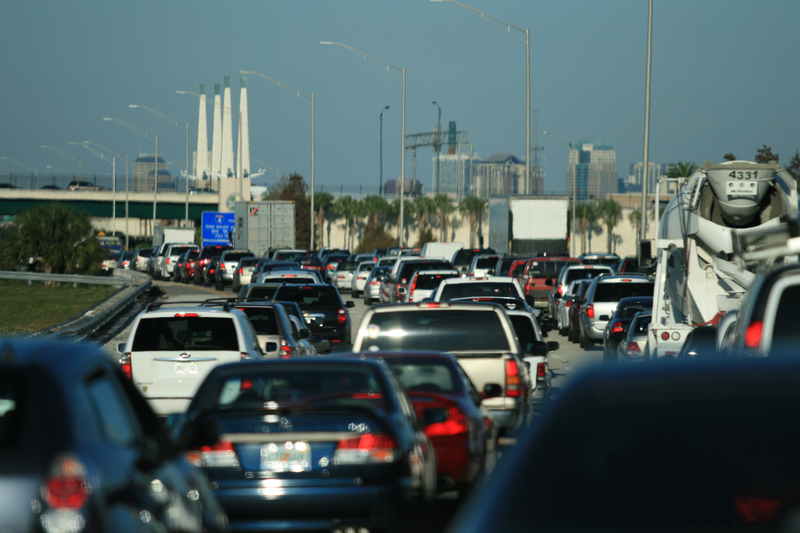 Traffic on Interstate 4 in Southwest Orlando–the usual mess. Here’s the reality about how people get around southwest Orlando, which is where I live and spend most of my time: the locals find the unused roads and do their best to avoid Interstate 4. Eventually, of course, the city planners realize, “Hey, look! We’ve got a lot more traffic on Blahblahblah Boulevard! We need to expand the road!” So they expand two-lane roads to four-lane divided highways to handle the increased traffic load. Naturally, the next stage in the process is that real estate developers will note the wider, more accessible road and will start selling more property on said road–commercial and residential. Businesses are built, people move in, the street becomes a “destination” area and once again the locals try to find “the road less traveled.” Here’s a crazy idea: next time you find a road that has high traffic that flows at reasonable speed, leave it alone! The worst traffic in SW Orlando is Sand Lake Road, from its western end at Apopka-Vineland Road all the way to Kirkman Road. The stretch between Dr. Phillips Blvd. and Universal Blvd. is particularly bad, but that area of high traffic is about to be extended by adding a Trader Joe’s on the north side of the street between Della Drive and Apopka-Vineland. I have no gripe with Trader Joe’s per se. The problem with most of the Dr. Phillips commercial area is the lack of adequate parking. This is hardly a new problem. Trader Joe’s, undoubtedly a popular chain, failed to provide a decent amount of parking for their new Winter Park store, with similar ensuing congestion. I am not a civil engineer, so I’m throwing myself on the mercy of those of you out there who are charged with designing streets, ramps, and parking lots made to support commercial properties. Please: stop what you’re doing. Update the equations that you use to estimate traffic flow by comparing estimates vs. reality…especially along Sand Lake Road. Do something different. Your processes for “growth” are increasing density where it’s least wanted and forcing more and more people to head out to the suburbs to fill up the empty space and avoid the congestion messes you’re creating.